I started working on this guy last week (on the kitchen bench) and have just finished his final baking. Although I love school holidays, I really miss my studio and it's been fantastic to be back in there every day this week.....I certainly achieve a lot more without constant requests for sandwiches and milk drinks, although, god love them, I really do have it easy when it comes to my lovely brood. Anyway, a couple weeks ago I overheard a woman in the supermarket call her husband (a rather crotchety looking fellow) an 'old goat'.....and this is the result. 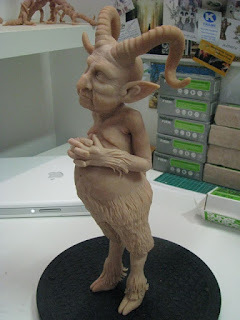 The hardest decision I had to make regarding him was whether to sculpt the fur or use a real pelt of some kind. 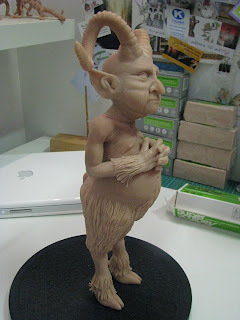 I chose sculpting as I thought it would be more controllable and not so potentially bulky but, it was a decision I regretted several times, particularly when working up an actual sweat trying to push clay through a very small clay extruder.....my fingers are still bruised. Regardless of the pain, I am pleased with how he's turned out.....of course he still has to be painted and costumed....and I can't quite believe I managed to get him to stand on his hooves (or is it 'hoofs'?). 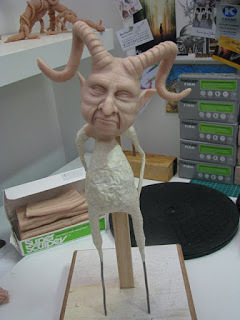 I'd like to say I'll be painting him tomorrow, but I've got some more ideas I'd like to get sculpted first so he'll have to keep 'evil tree lady' , 'fat faerie' and 'small dragon thingy' company in their shared incompleteness. You did an outstanding job as always! He's a wonderful work, his detail are perfect!! 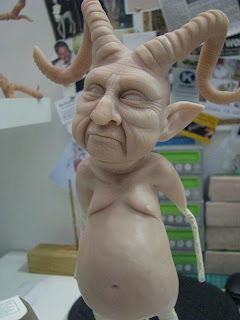 How intriguing is his expression, cannot wait to see him finished! 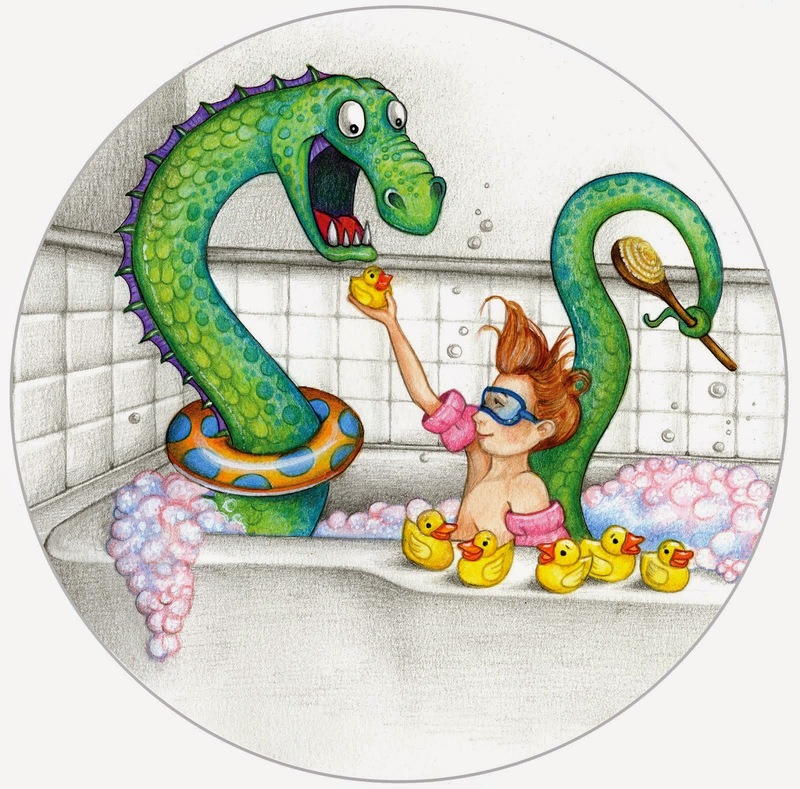 it is always a joy to visit your blog & discover your new creations,and watch the process. i so love all the detail that goes into your work. inspiring indeed. I love this guy and at least he doesn't have to listen to a wife yammer at him. Beautiful work. He looks like my ex!! LOL Regardless, he's one heck of guy! I hate those little extruders, so I use a garlic press or a ricer...much less intrusive on the fingers and carpel tunnels. 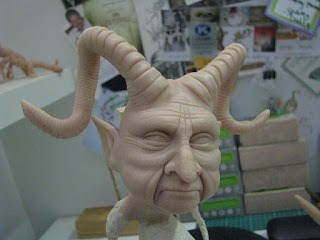 I can't get over how much character you are able to put into your sculptures - they really are incredibly gorgeous. 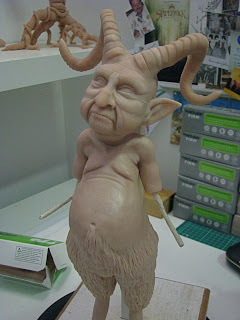 Old goat is no exception - can't wait to see him finished. I have been followed by your creativity, and very happy that now I can watch the process of building from the inside!